From the very beginning, when we first decided to visit Russia on a river cruise, we were asked, ‘Why?’ For us, the answer was easy. We’d never visited Russia before. This huge country has been a big part of our world’s history for more than a thousand years. And, yes, it’s pretty darn interesting in today’s world, too. Who wouldn’t want to take a closer look? We’re also asked questions about the logistics of traveling to Russia. 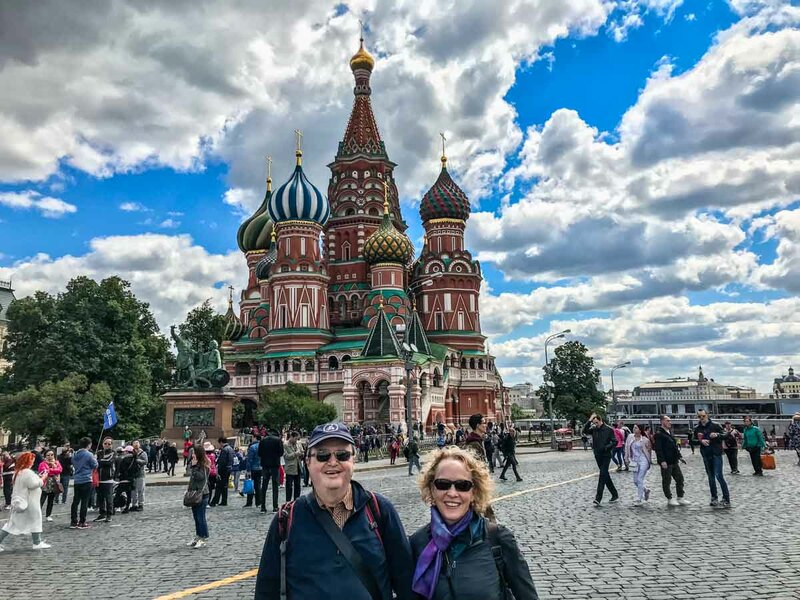 The short answer is that by touring with Viking River Cruises on a sailing from St. Petersburg to Moscow, we not only had a great introductory itinerary handed to us, but were not burdened by having to arrange visas and accommodations on our own. Surprisingly, despite our repeated advice to the contrary, we didn’t spend time on our own in Russia before or after the cruise. We didn’t even stay to see a World Cup game! Partly, that was because we were rushing our visa process and didn’t have time to make the internal travel arrangements ourselves. Partly it was to return home to family, and partly it was, meh, let’s see how we like it first. We finally made it to Russia, thanks to Viking River Cruises. So with visas and flights arranged by Viking, we arrived on board April 30. “How many of you have friends who wonder why on earth you are visiting Russia?” the crew asked a few times. Perhaps they’d been noticing a drop in American travelers. Our ship of about 170 passengers (capacity is around 200) was about 75% American, and that’s less than the average European river cruise. Inscrutable Russia became our home for the next two weeks, and Viking’s three onboard Russian guides and the Russian crew became our companions and interpreters. We had time to venture out on our own, digest what we were seeing and hearing, and consider the lives of Russian people rather than the mere gloss of the current regime. Apart from being in Russia, the rhythm of this river cruise was extraordinary, too. 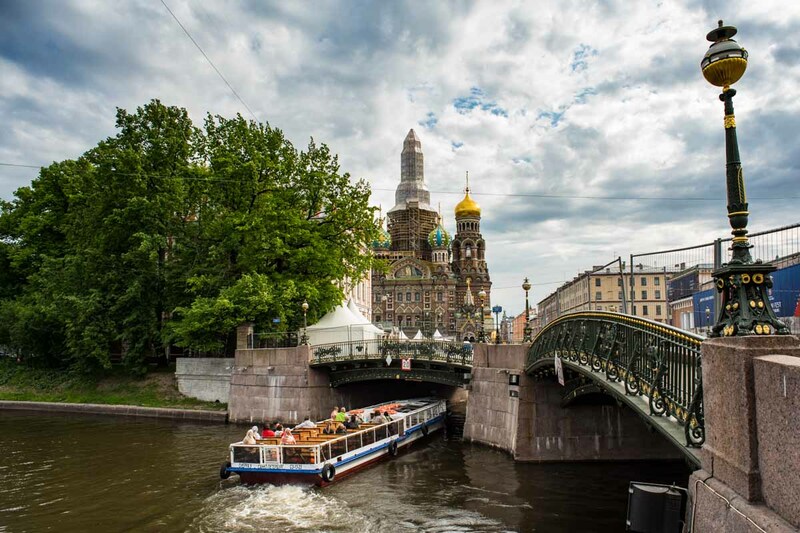 Between the bookend three-day stays in St. Petersburg and Moscow, we sailed for six days. The waterway between the busy urban centers includes three rivers (Neva, Svir and Volga), 17 locks, narrow canals and two of Europe’s biggest lakes. The wilderness is never far away. Russia’s boreal forest is called Europe’s lungs. Even though we were seeing just a sliver of western Russia (the Ural Mountains divide Russia’s European and Asian sections) we could begin to grasp the enormity of the country: endless forests, lakes without shores, and thriving river towns between the two metropolitan areas. One of the “vistas” of Saint Petersburg: the Church of the Savior on the Spilled Blood, as seen over one of the Saint Petersburg canals. This optional Viking excursion, “Hermitage Behind Closed Doors,” is a triple treat and then some: visiting the Winter Palace, viewing the art, and taking in some of the vast collections at Open Storage. With our excellent guide, Yuri, we arrived early and had a chance to look and listen in relative calm, learning about Catherine the Great’s initial purchase of 255 paintings in 1764, and subsequent expansions to the museum. Besides the classic Renaissance paintings, the newer French Impressionist galleries located across the square in the renovated General Headquarters are astounding…and poignant. The lion’s share of the art was confiscated from private collections by the State after the 1917 revolution. This special tour also included a guided visit through Open Storage, where thousands and thousands of pieces of art–paintings, furniture, sculpture, and royal treasures are renovated, protected and, on a limited basis, displayed. The Hall of Carriages and the massive hand-woven tent gifted to Catherine the Great by the Turks leave quite an impression. 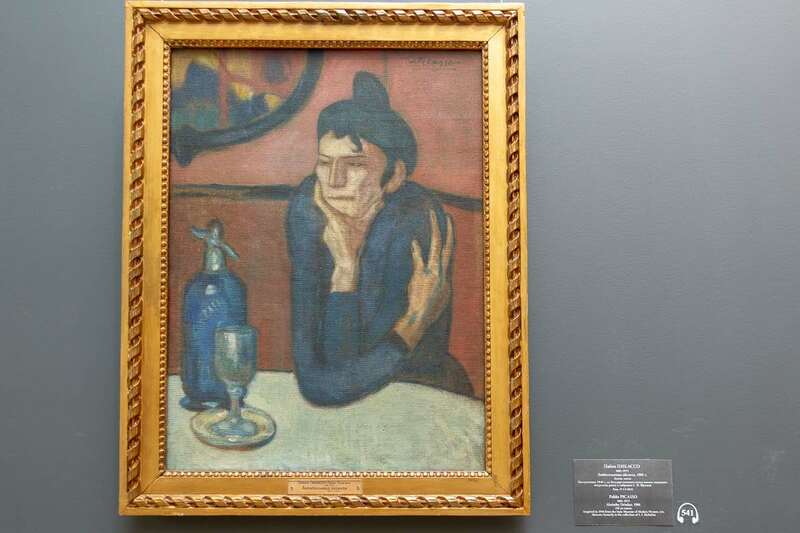 Picasso’s “Absinthe Drinker.” The Hermitage Museum’s didactic usually describes the artwork’s path to the gallery. This was one of our favorite included tours. Our Viking guide, Slava, combined history with fun anecdotes and a good attitude. We especially enjoyed ducking into the gorgeous Art Nouveau Eliseevsky Emporium (think gifts, deli, coffee and sweets), walking through the Iskusstv Park (in the arts district near Russian Museum), and along the Neva River. The walk provided some historic and geographic context for our later sailing: the Neva River flows in Lake Lagoda (Europe’s largest lake) which was used in winter’s freeze as a supply route and a means of escape during the deadly, 900-day Siege of Leningrad, in World War II. We used our walking tour experience to return to central St. Petersburg by metro from our ship’s dock to visit inside the Church of the Savior on the Spilled Blood and the Russian Museum, take more photos along the canals, stop in a sidewalk cafe, and enjoy getting to know the St. Petersburg scene. We used the metro system and a map provided by our Viking concierge to get around, and paid for lunch and admissions with rubles and a credit card, too. St. Petersburg is just as easy to navigate as any other international city. What fun to take in a ballet in Russia! 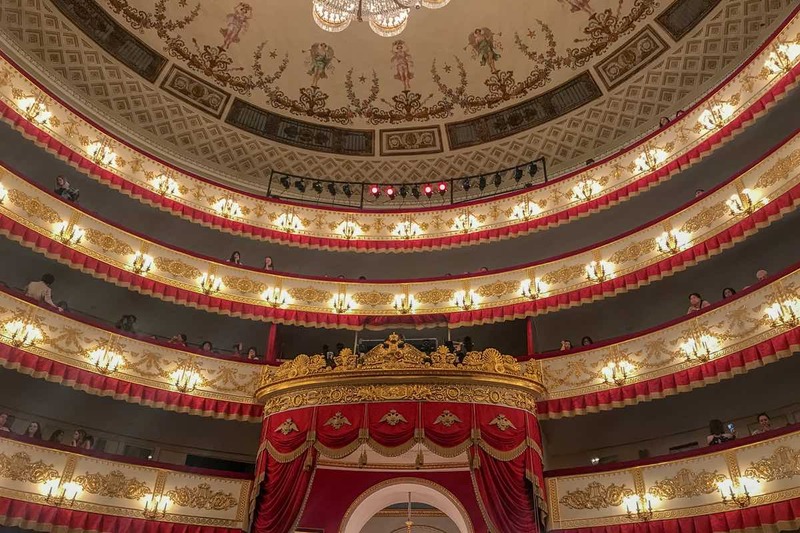 Even if this wasn’t the Bolshoi (and even if Swan Lake’s ending was sanitized for tourists), is was a thrill to see the beautiful Alexandrinsky Theater, and exciting to sit next to a young girl enthralled taking in her first ballet. Next time, I’ll plan on getting tickets to the Bolshoi in Moscow, too. This is just the weekend cottage used for privacy by Catherine the Great and family. 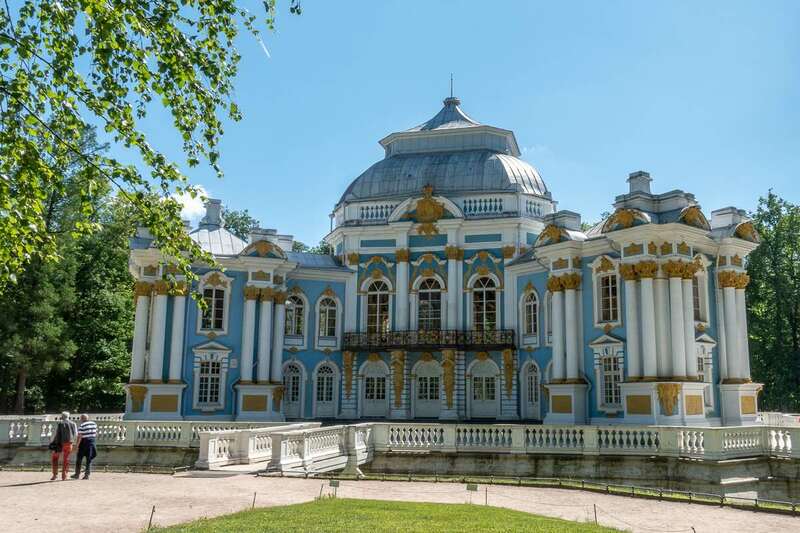 Her palace and gardens are in Pushkin, not far from St. Petersburg. By taking a day of our own in St. Petersburg, we missed a tour of Peterhof Palace that we’d already reserved. No regrets. We also passed on the Faberge Museum tour, but smart friends on board visited the museum’s gift shop on their own, for free. With more time, I’d have enjoyed the optional Communalka home visit, too. These communal homes shared by multiple families are still in use, and Viking’s home visit arrangements are always worthwhile. 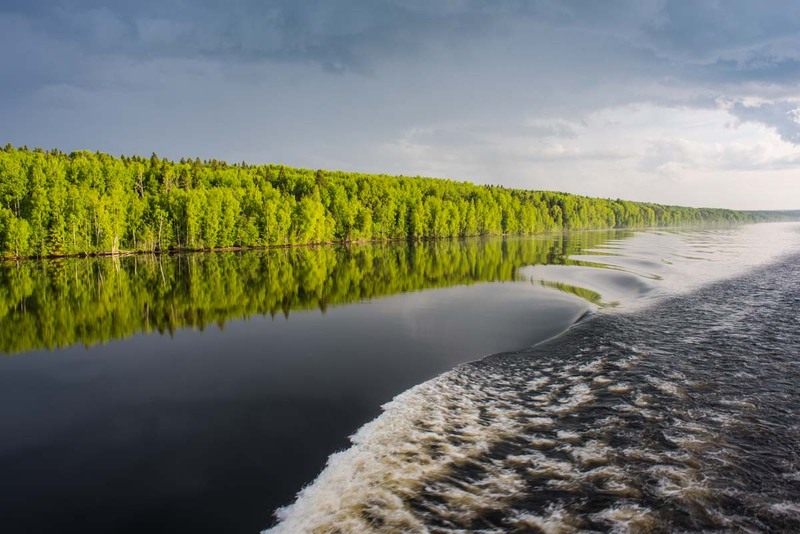 Sandwiched between the two big city visits, sailing the “Waterway of the Tsars” is especially beautiful and relaxing, combining wild rivers, big lakes, and man-made locks and dams. The sailing reveals how average (rural and small town) Russians live, and offers a peek into the dense Russian boreal or taiga forests. In the process of building the navigable river system and dams, some population areas were inevitably flooded. So the journey is marked by remnants of church towers poking out of the water, and a few resettled communities. After sailing on the Neva from St. Petersburg and through Lake Lagoda, our ship cruised along the Svir River toward Lake Onega. The original Mandrogy village on the Svir was destroyed in World War II. The current, reconstructed village was built as an open air museum for tourists, with shops, a bakery and a vodka museum. The best bet is to book a traditional Russian sauna, a banya. We loved the experience and the refreshing smell of wood and steam. Birch twigs with leaves are clustered together and used to lightly whip your skin into a tingling frenzy. That’s followed by a cold jump into the river and a rest over a cup of hot tea and fresh jam. Rinse and repeat! Wonderful. 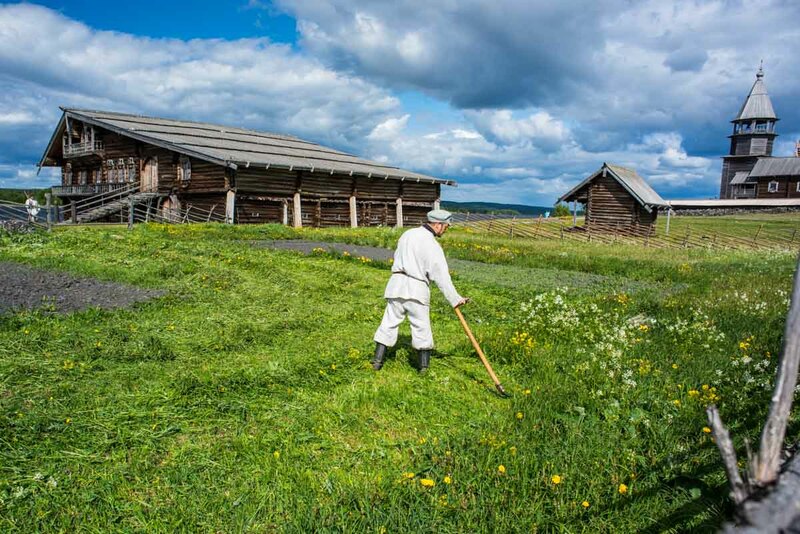 The UNESCO World Heritage Site of Kizhi is maintained by island residents in the old ways, by hand. 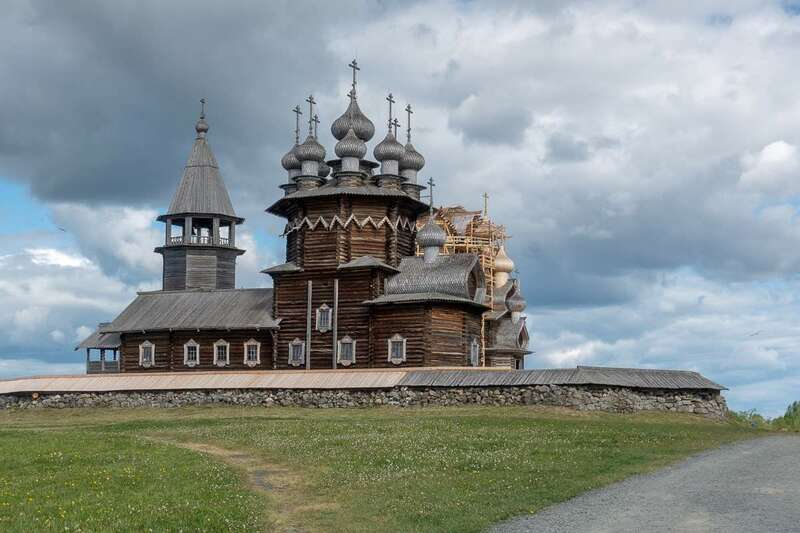 The magnificent 18th Century Church of the Transfiguration on Kizhi Island is one of 80 historical wooden structure. Though I appreciated all I learned on the guided tour, I’d loved to have rented a bike to cover more ground on this picturesque property and imagine the isolated lives of its residents. 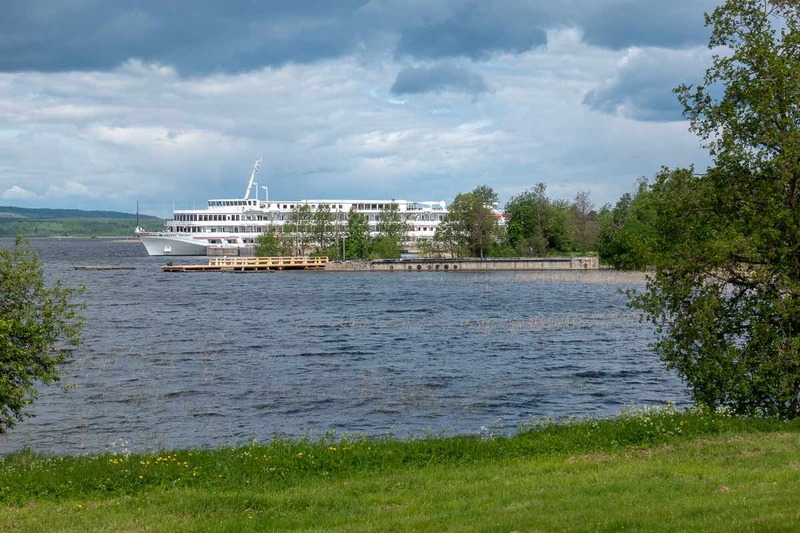 After Lake Onega, the cruise passes into the complex Volga-Baltic Waterway. Our side trip to the Kirillo-Belozersky monastery was perfunctory, but we did get a whiff of the power and influence of the church from the Middle Ages. The little museum here has some excellent icon art worth seeing. 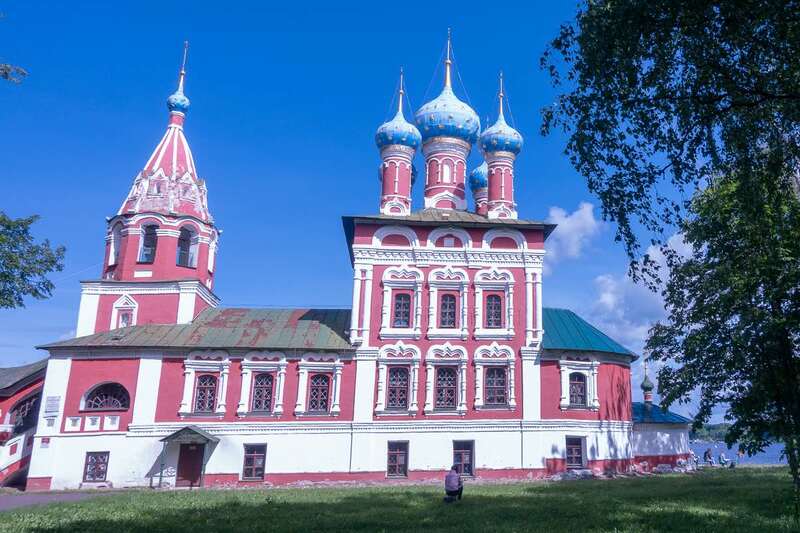 A visit to Yaroslavl the following day is featured in this post by Tom. For some on board, this might have been ‘one church too many,’ but for art and history lovers, well, we can never get enough. This Volga River town, once known for its watch manufacturing, was one of our favorite stops along the way. Tom’s photos and story tell more. 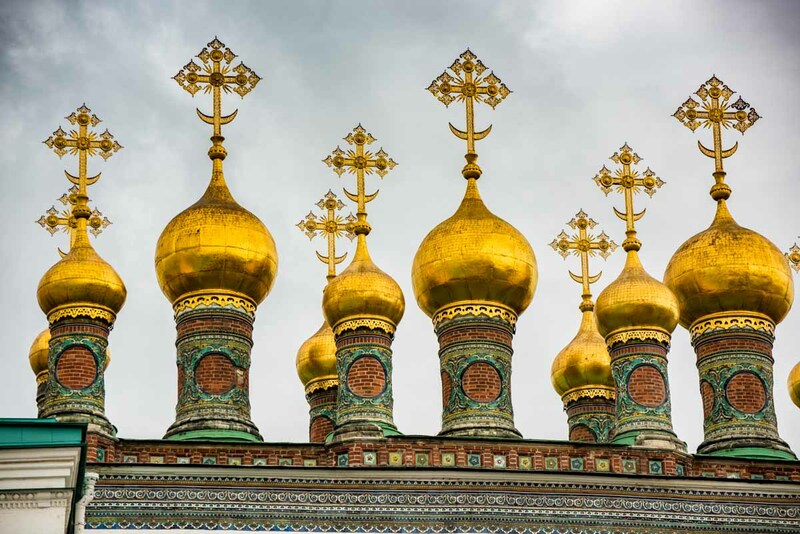 The highlights were splitting from the group and walking around the small Kremlin (literally the citadel within the city), taking more photos in churches, and finding fine examples of hand-painted lacquered, papier-mâché boxes, a Russian craft treasure. What will stay with us as long as those lasting gifts (we bought three) is the home visit with Viktor and Tatiana, long-time residents of Uglich. The famous Chaika watch factory where they both worked has mostly ceased operations and the couple is retired. It was lovely to visit their two-story home. They spent 10 years building the home, paying as they went, while living with other family. Once they moved in with their two children, Viktor said, they spent another 10 years completing the work. Virtually every home in the area has its ‘kitchen garden,’ a productive plot of any size to help supply the table. Using a greenhouse and inside starters, Viktor and Tatiana’s garden was full of cabbage and lettuces, cucumbers, tomatoes, strawberries, dill, onion and garlic. With translation help from our Viking guide, we had a good personal visit, and could share the enthusiasm for their home and family. 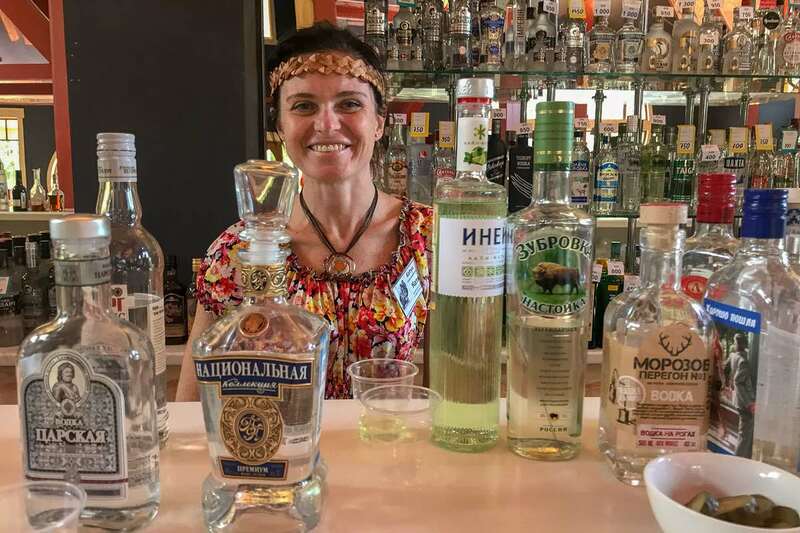 Tatiana, by the way, with her engineering background, has mastered the art of homemade vodka and delicious dill pickles, both of which we were invited to sample. Our visit to Moscow wasn’t ordinary, because it fell just days before the start of the FIFA World Cup 2018. To some extent, that was an advantage. Moscow and other cities have added Latin alphabet names along with the Cyrillic on many signs, including public transport. The disadvantage was the scaffolding and crowd management around Red Square which prevented us from seeing the big picture and from visiting Lenin’s tomb. June 12 is also Russia Day, celebrating the founding of the Federation in 1991, so a Red Square parade was in the works. No one seemed to be clear on what would be open or closed to visitors that week. 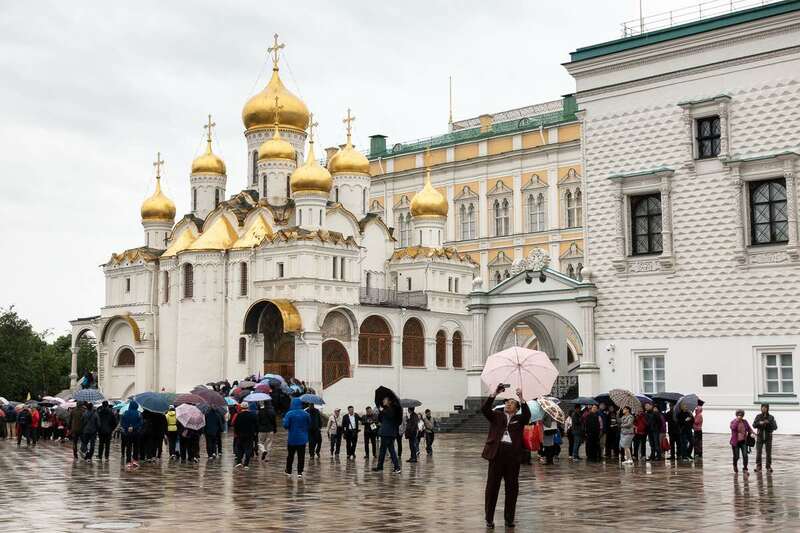 Moscow’s Kremlin square offers access to multiple historic churches–and crowds of tourists. In hindsight, we wish we’d skipped the guided tour and gone off on our own. We had had enough SLOW group pace at this point! Sans group, we’d have seen more faster, and learned just as much. We saw enough in Moscow to know we could happily spend another week there, primarily to visit museums, shopping streets, parks and restaurants. An unexpected bright moment in Moscow was a special concert at the Foreign Affairs concert hall–a lengthy bus ride through Moscow’s horrendous traffic–by the excellent musical group called Moscau. Playing everything from classical music to folk and show tunes, the performers showed off their musicianship and the sounds of each instrument: domra, accordion, harp, balalaika, flute, and percussion. This was an included treat. 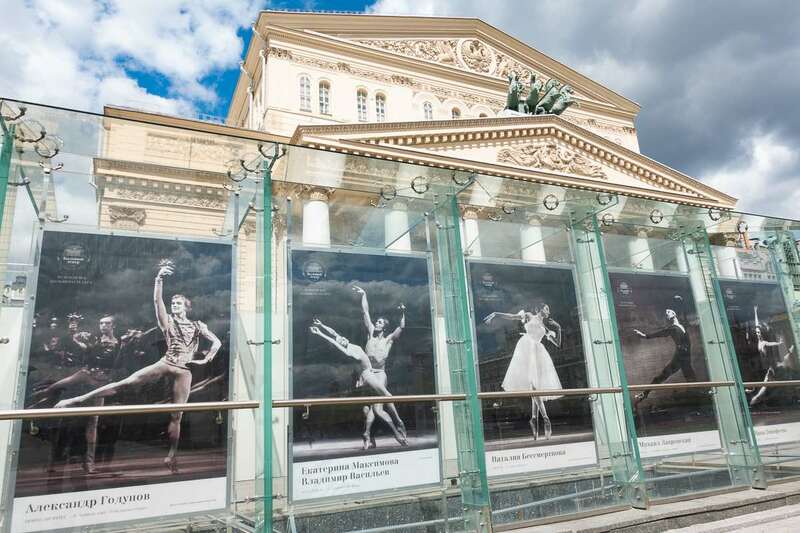 We had fun trying to translate the Cyrillic titles on the Bolshoi’s historic show billboards–like solving a puzzle. 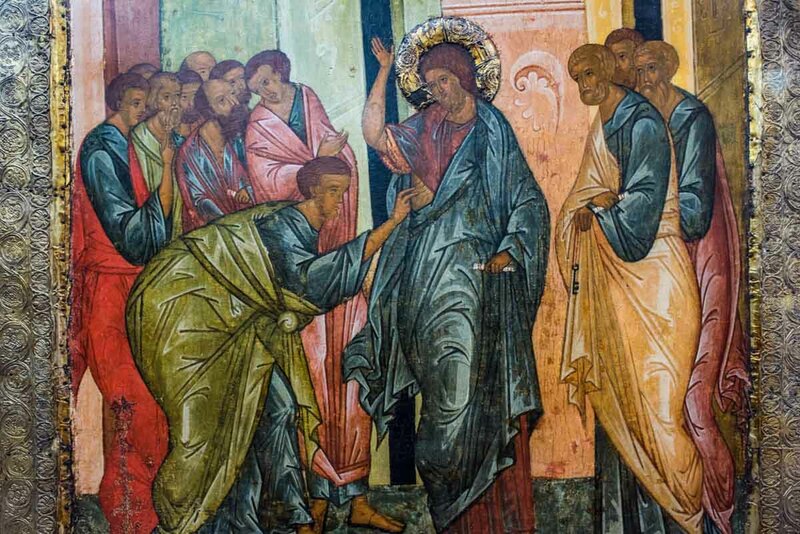 Fortunately, when we bailed on the tour, we managed to be shown into three other churches in the Kremlin, all packed with superior examples of iconography and other art–and far less crowded with tourists than the other two churches we visited here. Use your Kremlin ticket to access all of these sights on your own. 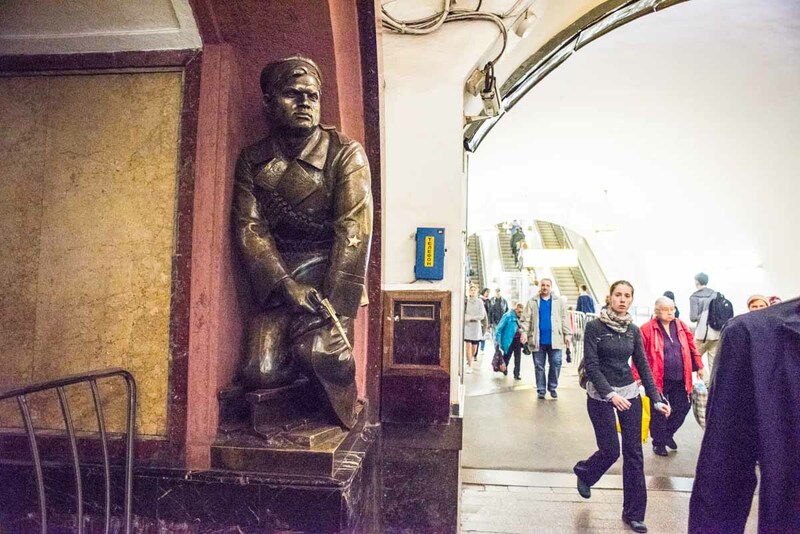 If you go to Moscow, be sure to check out the metro stops with imposing Soviet sculptures, marble stations, and Art Deco flourishes. Any walk will take you through Red Square, lined by the enormous GUM shopping mall on one side, the Kremlin on the other, and the St. Basil’s Church (a museum) at one end. For great views of the river and city, walk behind St. Basil’s to Zaryadye Park, or visit the Cathedral of Christ the Savior and then cross the pedestrian bridge nearby. 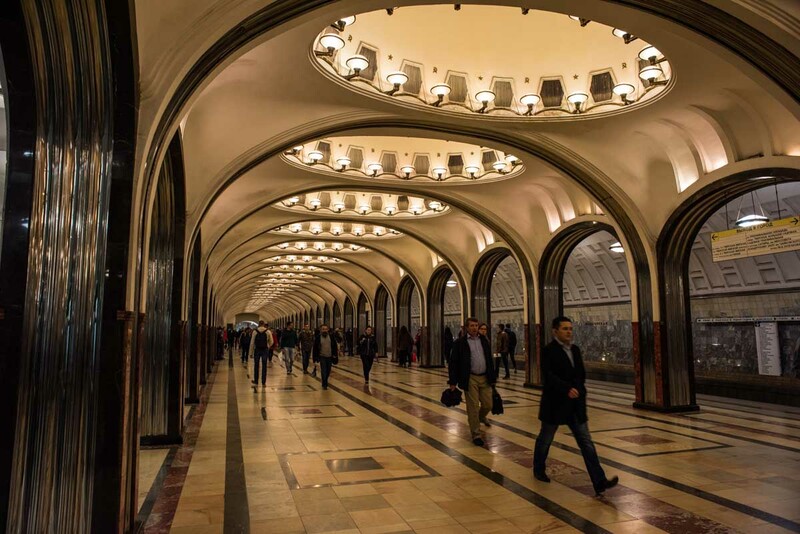 The beautiful and loud Moscow metro stations. Take the Metro, see art. Because of confusing directions from the Viking concierge (why didn’t I just use Google maps as I normally would?? ), we missed the Izmaylovskiy flea market. We’ll try again next time. We’d hoped to tour the Moscow Military Museum as described in our cruise documents. Alas, that tour was inexplicably cancelled. Optional tours other guests enjoyed included Treasures of the Kremlin Armory, The Pushkin Museum, and Tretyakov Galleries. Our Moscow visit was a strange combination of colorful soccer fans ready to start partying, and reserved Russians in drab jackets (in June). Don’t expect warm greetings as you enter a store, although we could see attempts were being made to adjust to the impending sports crowds. The long metro ride back to our ship was brightened by the fresh flowers several people carried home from work. Russian dinner guests usually present flowers to their host. 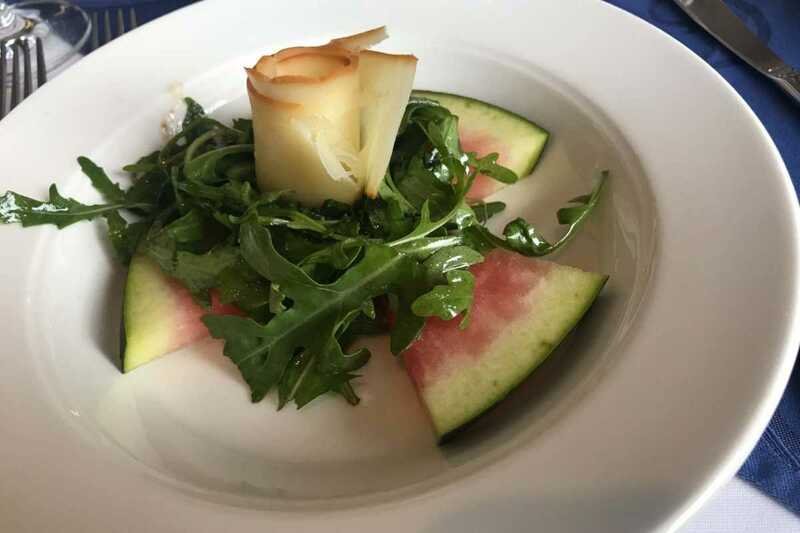 Fresh fresh salad of watermelon and a taste of the local cheese. Within the first day on board, I’d eaten both beef stroganoff and borscht, so I was a happy camper. The lunches and dinners on board were consistently applauded and usually featured local dishes. Viking always offers menu options plus some regular standbys like salmon or salad in case you feel like falling back to some old favorites. Viking River Cruises provides daily bulletins with background information on the sites and excursions coming up. These notes certainly enhance the tours and prime the brain for absorbing all the history. During the more leisurely days of sailing through the Waterway, the programs on board were fun and worthwhile. Russian language lessons included a handy guide to the alphabet and common words and phrases. (It’s fun to start reading Russian signs. Pectopah!) Three history presentations concerned the Romanov Dynasty, the Soviet era (Gorbachev and Perestroika), and Russia today, focusing on the economy under Putin/Medvedev. Info from the latter was taken with a good dose of salt, if not vodka. A cooking demonstration offered lessons in preparing Pelmeni. I have the recipe to try at home. Don’t forget the sour cream. 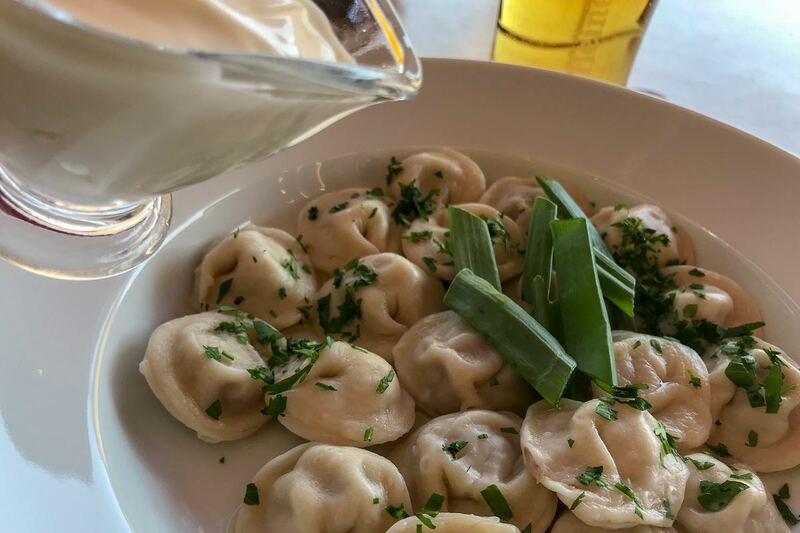 Pelmeni, little meat-filled dumplings, are a staple item at home and in restaurants. As is usual with Viking River Cruises, some shore excursions are included and some are not. The extra charges for excursions can add up–seemingly more on this trip than others we’ve experienced. We budgeted $400-$500 in extra excursions, and added a bit to that. The total expense could double that if you sign on for most of the optional tours. Be aware that programs and times can change as the program director works with local operators and attractions. Remember you can cancel out of your included tours and set out on your own. However, you cannot get a last minute refund when you cancel your pre-booked optional tours, unless someone steps up to purchase your spot. The Viking Ingvar delivering us to Kizhi Island. Once we have our feet on the ground (er, our bags onboard), we remind ourselves that sightseeing on our own is perfectly do-able and desireable, despite fear of missing out on good info from guides. Our self-guided tours might be visiting the very same things as on an included tour, but at our own pace. When it’s just the two of us, we get a more personal sense of a place, linger longer where we want, make spontaneous decisions, and enjoy finding a meal at a local restaurant–just like a local. And then…we people-watch. Why travel to Russia? To see it for yourself! Note: We were hosted on the “Waterways of the Tsars” cruise by Viking River Cruises. 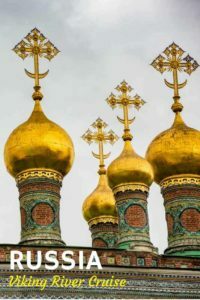 This and our other Russia river cruise posts represent our own experiences and opinions, and have not been reviewed by Viking or their partners. Check out the links below for tours you might have missed, or want to add on. If you take one of these tours, Travel Past 50 will make a small commission at no additional charge to you. Share the love. Pin this or use any of the social media buttons below or above the post. This Viking Waterway of the Tsars is the very cruise I long to take! I feel inspired by your excellent photos. Enjoyed your post very much. Thanks, Carole. It was above and beyond our expectations. We loved the variety between cities and the time on the water. I just soaked up every word and image. Fascinating country and how wonderful to see it from the water! I would, like you, be happy to strike out on my own at times. There’s always a bit of FOMO but other magical encounters may emerge. Thanks for this taste of Russia. With all the dreadful political news it’s easy to forget the country and citizens are going about their daily lives. Exactly, Elaine. There was definitely a sense of appreciation that we were there visiting the people and history of Russia, not focused on the current political powers. Russia is fascinating! My great grandparents (ethnic Germans) immigrated from a village on the Volga in the later 1800’s. They ended up on homesteaded land in Oklahoma (Cherokee Land Rush) what an adventure that must have been. Loved this post! Wondering how affordable independent travel would be? The cruise looks magical. What a lovely stress free way to see Russia. Yes, we were in good hands. It’s always good to remember that the ship’s front desk and program directors are really your personal concierges. We had a good time! Fascinating read, particularly as we are taking this cruise in two weeks. I appreciated your thoughts on breaking away and going on our own. It seems that is quite doable. My concern now is the weather and how to pack. Thanks for helping build our anticipation. Oh! Please do follow up with your impressions. We’d love to hear more, either here or on our Travel Past 50 Facebook Community page. Thanks! Great post! We visited Russia on an ocean liner and seem to have seen many of the same things. There is an added feeling of security when you travel with a trustworthy tour operator like Viking, or in our case Crystal Cruises. Great photos that make me yearn to return! True, Irene. Did your ocean cruise go past St. Petersburg? That’s a great way to visit Baltic and Scandinavian countries, too. Thanks for bringing this to our attention. We did a Baltic cruise and had 3 days in St Petersburg. It was lovely and we anted to go back to Russia. Looks like a Viking cruise in Russia may be the anwer. We are trying Viking for the first time in China next month! Oh wonderful. We really enjoyed the China cruise with Viking. Have a great time, and I hope you will be able to dig further into Russia on a Volga River cruise, too. I’m researching St. Petersburg now. It’s been on my bzucket list since l saw a documentary on the Hermitage museum. Did you go to the Fabrege Museum? If so, how far was the museum from the boat? We did not go to the Faberge Museum. It was an optional shore excursion from the boat, so I’m guessing it took half an hour to get there, pretty much like the trip to the Hermitage. Thank you. We are taking this same trip in August. I read your story with much interest. Thank you, Douglas. We know you’ll have a great time. We did.